Our integrated workshops and extensive experience working with a range of customers has enabled us to build a range of skills ideally suited to the manufacture of capital equipment complete units or sub-assemblies. A heavy duty sissor-lift table capable of lifting over 10 tonnes. Complete bearing housing, shaft and sprocket assemblies. 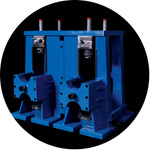 A large bespoke box-section forming mill with quick release tooling fully manufactured in-house. A large special lifting frame assembly. A large fabricated mould for the crucible market. A large fabricated bracket with hardened wheels for a large overhead crane.